Do you need a good sized table that can be extended further to accommodate your guests? Are you also the sort of person who values quality of design, build and raw materials? Then the Milano 6 foot 8 inch extendable may be just what you are looking for. The extendable table has a handy panel which you store underneath. The table can sit in three sizes – closed, one panel or two panels. 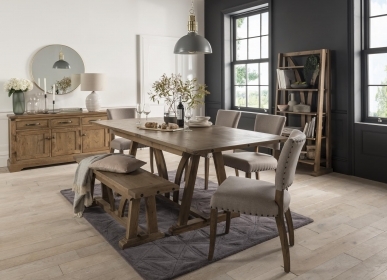 Handmade by craftsmen using traditional techniques, this strong table is constructed from pure, high quality American White Oak that has been given a smooth and flaw free finish that will delight you and your guests.